This division of Public Health is responsible for the administration and enforcement of New York State Uniform Fire Prevention and Building Codes in Chenango County. The goal of this division is to insure that new and existing homes, shops, restaurants, places of worship, work places, and all buildings within the county are safe for those who enter. This is accomplished by overseeing the planning, construction, and use of all buildings. 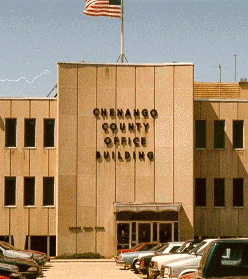 Chenango County Fire and Building Code Enforcement Department enforces the NYS Fire and Building codes for all municipalities within Chenango County except: Town and Village of Greene, Town of New Berlin, Village of Earlville and the City of Norwich. These are issued to applicants, plans and specifications submitted for compliance review with New York State Uniform Fire Prevention and Building Codes. Permits are issued for heating units, swimming pools, buildings, and structures. Regularly scheduled Fire Prevention and Safety inspections are conducted in places open to the public. The purpose of these inspections is to educate property owners regarding fire safety and to identify any possible hazardous conditions. Owners are made aware of any violations and follow-up inspections are conducted to verify compliance. Typical violations are blocked exit doors, improper storage of combustible materials, insufficient emergency lighting, outdated fire extinguishers, and overuse of extension cords. Most property owners appreciate our advice and become more vigilant once the violations are identified. All bonafide complaints are responded to and investigated by our inspectors. Follow-up on corrections of violations are addressed. Staff is available to assist builders, homeowners, and design professionals with any code-related questions by accessing building codes, testing laboratories, as well as federal & state agencies. Information regarding pool safety and current regulations are also made available. The Code Enforcement staff work closely with Environmental Health, Nursing staff, Child-Protective Services, the Department of Social Services, the Department of Environmental Conservation, Town and Village Officials, local Fire Departments, and the Office of Emergency Management in an attempt to provide a safe and clean environment for all residents of Chenango County.